- GBP/AUD declines as Aussie Strengthens after Chinese Data. - AUD rebound to extend but BMO warns of USD comeback. Australia's Dollar was on the offensive Friday after People's Bank of China (PBOC) data later showed loan issuance by domestic lenders almost doubling during March, after having fallen sharply in February, while the trade surplus also rebounded from depressed levels too. Given widespread concerns about a continued slowdown in Chinese growth hurting the global economy, Friday's economic numbers gave markets a lift and helped the Renmimbi-following Aussie back onto its front foot, but some analysts were unimpressed by the response. "Naturally, we’re sceptical, but that doesn’t mean we want to fight the trend lower in the USD just yet. But the source of that scepticism is multi-pronged," says Stephen Gallo, European head of FX strategy at BMO Capital Markets. "even if the data do suggest that a stabilisation in China’s economy could happen by year-end, we’re no less confident that Chinese stimulus is unlikely to save the global economy than we were a few days ago." Gallo says the recovery in the trade balance and increase in lending growth could have been distorted by Lunar New Year factors and that stabilisation of growth in China will depend heavily on the outcome of trade talks with the U.S. and also on whether the U.S. then launches another "trade war" on the EU. "These are both big “wild cards”. For the time being, though, the narrative is looking rosier as far as FX markets are concerned, and so the path of least resistance will be towards modest USD weakness. 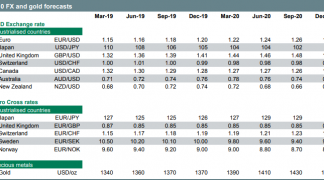 Watch it bleed lower, but we would caution against losing sight of the fundamentals, which are still USD-supportive against a number of currencies on a 3-6M basis," Gallo wrote in a note to clients Friday. Above: Pound-to-Australian-Dollar rate shown at hourly intervals. The Pound-to-Australian-Dollar rate was quoted -0.39% lower at 1.8257 Friday and is now up just 0.89% for 2019, while most other Sterling pairs were higher for the session. The AUD/USD rate was 0.89% higher at 0.7185 during noon trading and is now up 1.9% for 2019, making it the third best performing currency in the G10 universe for the year-to-date. Above: AUD/USD rate shown at hourly intervals. 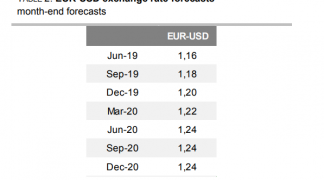 ING forecasts the Pound-to-Dollar rate will fall to 1.27 before the end of September, which could mean there's also a risk of a lower Pound-to-Aussie rate. But earlier this week analysts at Westpac, one of Australia's four largest lenders by assets, forecast 11% upside for that exchange rate before the year is out. Westpac says interest rate cuts from the Reserve Bank of Australia (RBA) will drive the Aussie to a multi-year low against its U.S. rival in 2019, and the Pound-to-Austrlain-Dollar rate to a post-referendum high even in the face of prolonged uncertainty about the UK's exit from the EU. The Pound-to-Australian-Dollar rate is forecast to rise from 1.82 Thursday to 1.96 before year-end, it's highest level since the days immediately before the Brexit referendum of June 23, 2016. 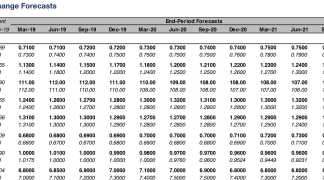 The AUD/USD rate, meanwhile, is projected to fall from 0.7160 on Wednesday to 0.68 in time for year-end.